If you are in need of a bail bondsman, call us for more details at 634-0000. Liberty Bail Bonds has been proudly serving its local clients in Duval, Nassau, Clay, and St. Johns Counties for over 20+ years. 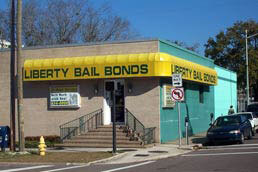 Under special circumstances, Liberty can serve your bail bond needs nationwide including surety and immigration bonds. We are conveniently located two blocks from Duval County jail. Just look for the bright yellow awning at the corner of Liberty & Monroe. Liberty is unique in that a licensed bondsman or qualified agency clerk always answers our phones 24 hours a day, 7 days a week. We provide our Clients with a full range of bail services in a timely, courteous, and confidential manner. We committ to transacting business with our Clients, our fellow bondsmen, and our law enforcement and judicial counterparts in adherence with only the highest moral and ethical standards. Insured by Bankers Surety Services, Inc.
Professional, courteous, friendly, ethical, fair.